Tips and ideas on the best ways to learn English faster. Babies learn their language slowly. First they learn to listen. Then they learn to speak. Finally, they can read and write. Try EnglishClub.com for Young Learners. Start a vocabulary (new word) notebook. Write words in alphabetical order (A...B...C...). Always use an English-English dictionary first. Why do you want to learn English? Before you begin (or go back to) studying English, ask youself one question. Why do I want to study English? Is it because you want to, or because someone else wants you to? Like every decision in life, studying English must be something you want to do. If you know why you want to study, setting goals is easy. For example, maybe you want to travel to an English-speaking country. Great. Your goal might be to learn "Survival English". Perhaps you already know many useful phrases, but you want to improve your listening skills and pronunciation. Whatever your goals are, write them down. How long do you need to study to achieve your goals? This answer is different for every student. The important thing is to be realistic. If you work 60 hours per week, don't plan on spending another 40 hours a week studying English. Start off slow, but study regularly. Use material that is challenging, but not too difficult. Find out what works for you. After you have studied for a few weeks, adjust your study schedule accordingly. Do you study best at night, or on the bus on your way to work? Do you like to study alone in a quiet place, or with friends and background music? Learning English requires a lot of motivation. Nobody is going to take your attendance when you aren't in class. If you are sure you are ready to begin studying, make a commitment. The things we do best in life are the things we enjoy doing. If you aren't having fun learning English, you're not studying the right way! You can be a serious student who has fun at the same time. Make up your own rewards program to give yourself incentives to stay on task. Most students want to communicate better in English. If this is one of your goals, it is important to study a balance of the four major skills. Listening, Speaking, Reading and Writing are the main (macro) skills you need to communicate in any language. Being very good at only one of these skills will not help you to communicate. For example you need to be able to read well before you can write well. You also need to be able to listen before you can speak. It helps to think of these communicative skills in two groups. It's simple. Think of it this way. First you have input. Next you have output. First you listen to someone ask you a question. Second you speak and give them your answer. First you read a letter from someone. After that you write back to them. These are examples of communicating. Input and output don't necessarily go in a specific order. Sometimes you speak first and then you listen. Sometimes you write about something you hear. During communication, the person you are communicating with uses one of the opposite skills. Therefore, in order to understand each other, everyone must be skillful in all four areas. Some students want to know which skill is the most important. Since all of the skills rely on each other, they are all important. However, to communicate we do use some skills more often than others. For example, about 40% of the time that we spend communicating we are simply listening. We speak for about 35% of the time. Approximately 16% of communication comes from reading, and about 9% from writing. These statistics are for an average communicator in English. Depending on someone's job or situation, these numbers may vary. Each of these main skills have micro skills within them. 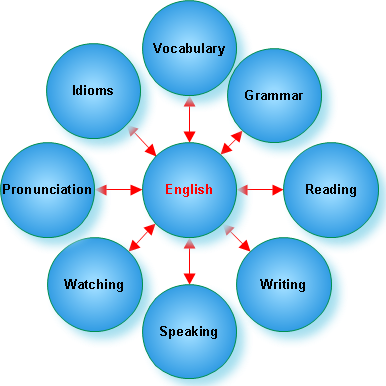 For example, pronunciation is a type of speaking skill that must be practised in order to improve communication. Spelling is a skill that makes understanding the written word easier. Grammar and vocabulary are other micro skills. Micro doesn't mean they are unimportant. Macro skills such as listening are very general, while micro skills are more specific. For the best results, create an agenda that combines all four areas of study. Allow one type of studying to lead into another. For example, read a story and then talk about it with a friend. Watch a movie and then write about it. This is what teachers in an English class would have you do, right? EnglishClub.com has lessons in all 4 key skills (and all minor skills), as well as many outside links to help you study further. Don't always have a pen in hand. Sometimes it helps to just listen. Children's programming is very useful for ESL learners. Choose programs that you would enjoy in your own language. Remember that much of what you hear on TV is slang . You can find these numbers at the front of telephone books in many English-speaking countries. Before you dial, make sure that you are calling the free numbers. Every day there are more and more places to listen to English online. Talk about anything and everything. Do it in the privacy of your own home. If you can't do this at first, try reading out loud until you feel comfortable hearing your own voice in English. This might feel very uncomfortable, but it will help you find your weak pronunciation points. Listen to yourself a few days later. Which sounds do you have difficulty hearing? For example, many languages don't have the "r" sound. These sounds require extra practice. When you get out into the real world, average people will have a more difficult time understanding you unless you practise speaking slowly and with proper pronunciation. Study word and sentence stress. Remember that you learn better when you are having fun. You want to learn new vocabulary, but you also want to understand what you are reading. If you are looking up every word, the reading is too difficult. You can do this for almost any type of reading. Who is it about? What happened? Why did it happen? Where did it take place? When did it take place? This is very useful when you have no comprehension questions to answer. You can write or speak your answers. It is a bad habit to always rely on a translation dictionary or electronic dictionary. Think of your English-English dictionary as your life line. Use online dictionaries when you are using the Internet (keyword online dictionary). Don't always pay attention to grammar. Free-writing can be very useful. It can show you that writing is fun. Have fun with the language. Stay in contact with teachers or other students. This is another exercise that can be done on a daily basis. Remember that regular activities are the best ones. Learn important spelling rules . Remember, you won't always have a dictionary or a spell-checker handy, especially when you are writing a test. Even native English speakers need to review the spelling rules from time to time. Learn commin English errors . Sometimes students get obsessed with grammar. This is especially true for students who grew up with strict grammar schooling. Remember that you only study grammar in order to communicate. Practise with a few exercises, then write an essay or have a conversation and try to use your new tools. Don't waste time on grammar exercises that you already understand just because they are easier for you. Concentrate on grammar that is difficult for you. If you are unsure of where your problems are, write a few short essays or paragraphs and ask a teacher to circle repeated errors. Then you can look up your problem and practise it. Find a friend who studies at a lower level than you. Teaching will force you to remember the rules and to understand them properly. Try preparing a worksheet for your friend. Stay organized. Keep separate notebooks for exercises, writing, and vocabulary. Use a pen that you love. Study in short, regular periods. Allow a short amount of time for review. Study in a place where you feel happy and comfortable. Don't allow distractions. Consider email, TV, and the telephone (unless in English) off limits while you are studying. Have a drink and snack handy so that you don't have to get up. If you study in pairs or groups, make an English-only rule. Stay with a homestay family. Learn from native English teachers. Gain access to English culture. Make friends with people from other countries. Offer language lessons/swap in your own native tongue. Qualify for a better job in your country (TOEIC). Get accepted to an American college or university (TOEFL). Study a broad range of whole language. Track your improvement easily (test scores). Take classes and get access to many listening exercises. Challenge yourself to improve your score. 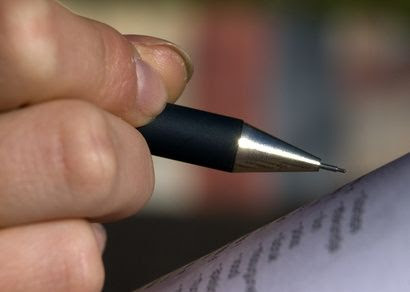 Learn and practise proper essay format (TWE/NEW TOEFL). Have an English-only evening once a week. Cook in English (rewrite your recipe in English) or watch English movies. Rewrite fairytales, jokes or instructions in English. Go out and pretend you don't understand your native language (try to get by in only English). Go online and find the lyrics to your favourite English songs and sing along to them (use a search engine). Invent an English character for yourself (with job, family, etc). Write this person's biography. Buy an English board game (like Monopoly or Scrabble). Start up or join an English reading or conversation club. Talk to yourself in English while you clean or do the dishes. Go around the house and try to name everything in English (furniture, clothes etc). Look up words you don't know.